Although slightly delayed by a month, Donald Trump’s State of the Union speech still managed to excite opinion when it was finally made before the US Congress, albeit for frivolous reasons. 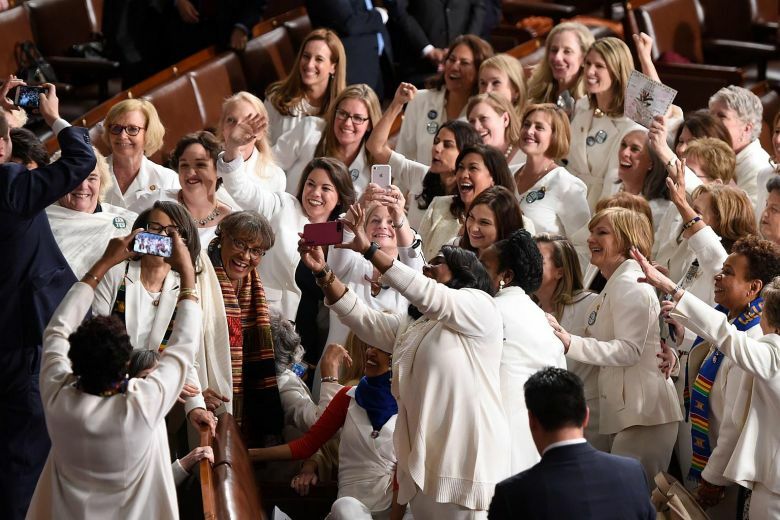 One of the main points of interest was the matching colour scheme used by a phalanx of the female Democrat representatives, including the House Speaker seated immediately behind the standing President. Amazingly, they were dressed in white! Although the white colour scheme may have had some wider political meaning, it was also a reminder of the parlous state of white America. In 1965, just over fifty years ago, the white European population of the United States made up 90% of the total population. Now, it makes up just over 60% of the population and is expected to dip below majority status within a couple of decades, if current migration and birthrate trends continue. However, as history shows, a declining majority population (regardless of race and colour) can easily meet a sticky end if it does not take measures to reassert its position and reverse its decline. In this ten minute video, the well-respected Jared Taylor of American Renaissance, in light of the 2019 State of the Union address by Donald Trump, casts his eye over the speech and the future for white Americans.